Fireplace tools and stoves are among the items found in colonial inventories that were used to heat domestic spaces, a necessity in Canada. 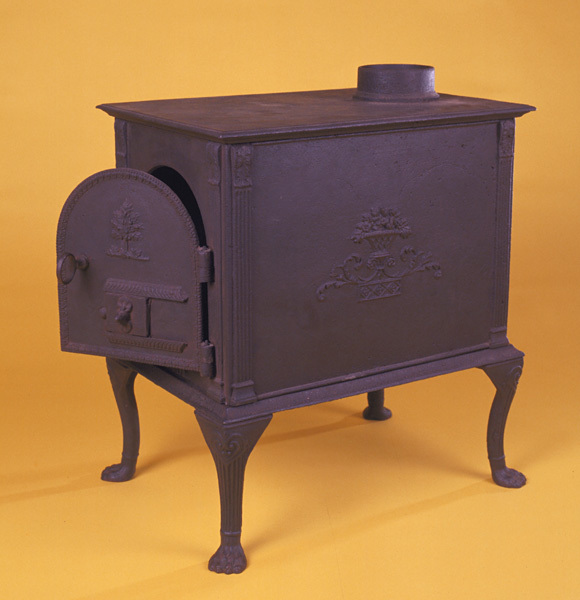 Although the cast iron wood-burning stove (poêle) seen here dates to the early nineteenth century, it is probably not too dissimilar from one owned by Madame de Saint-Vincent in 1742. Although most inventories simply record "stove," in rare instances a comment is included on decorative iconography. The inventory of Montréal merchant Jean Latour describes an iron stove embellished with three lions in 1749. It stood in the salle of his home in the rue Saint-Paul. Other implements used for keeping fireplaces warm include pokers, shovels, tongs, and andirons. The king's surgeon in New Orleans, François Goudeau, owned a pair of silvered andirons in 1759.